Hi everyone! 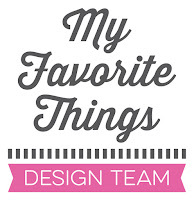 It’s time for the July My Favorite Things release replay! Today, the MFT design team is taking a fresh look at the most recent release. I created a clean and simple scene using the trees from the Fierce Friends as branches with leaves. The background sky was sponged with Distress ink using the newest Mini Cloud Edges stencil. The roar is from the Fierce Friends set too. I cut a fancy speech bubble around the sentiment with scissors. I used hemp cord for the string swing. I stamped the character and the trees/leaves with Black Licorice hybrid ink, colored them with Copic markers and adhered them with foam pads to the card front. 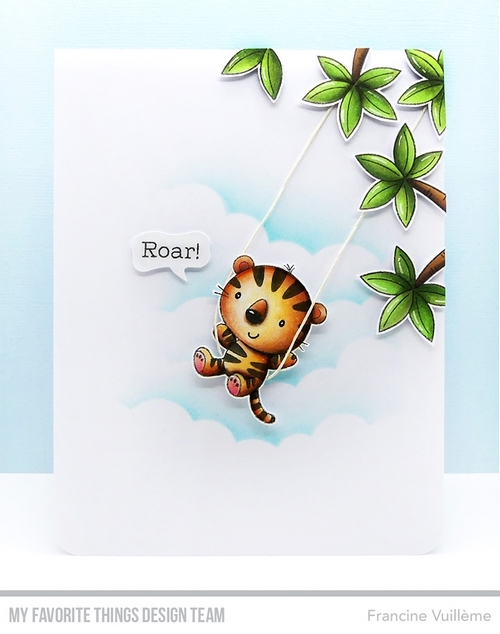 This card could be for any occasion as the roar can mean anything (I love you, hello, happy birthday, etc.). It could be a great masculine card too. Such a darling card, Francine! Your fluffy clouds are so pretty and your Copic coloring has truly brought these images to life...WOW! Francine, I totally love this card. When I saw this little tiger that is how I invisioned him!! Love this!